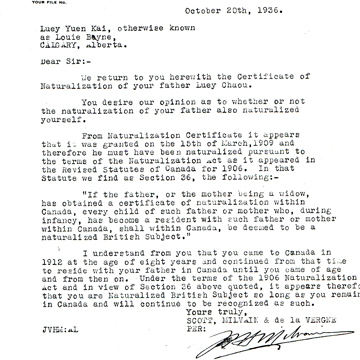 Legal opinion letter affirming Chinese–born Luey Yuen Kai's status as a British subject rather than an Alien under Canadian nationality laws, 1936. Courtesy of Alice Louie–Byne. Anti–Chinese legislation enacted in Canada during the late–19th and early 20th centuries was motivated by a combination of factors, including racism, economic competition between European and Asian workers in Canada, and international politics. These laws, in addition to traditional Chinese migration practices, shaped Chinese communities in Canada by creating drastic gender gaps and separating families. The laws could be confusing for those affected, and left some unsure about their legal status in Canada. Chinese communities continued to feel the legacy of the legislation long after the laws were repealed. This exhibit considers immigration laws, citizenship laws and civil rights discrimination, to explore the human impact of anti–Chinese legislation between 1923 and 1967. The stories show how Chinese Canadian women worked inside and outside of the legal system to overcome inequality.